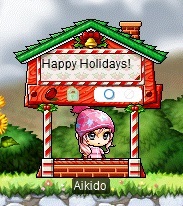 Cash Shop Update for December 6 | Dexless, Maplestory Guides and More! Discussion in 'Maple Updates' started by Nexon, Dec 6, 2017. December 6 to January 2 in the Special Promotions > New Arrivals category in both Reboot and non-Reboot worlds. Sierra Grace Dress (F), Cherry Rabbit Hood, 5 O'Clock Shadow (M), Flower Garden Morning, Crystal Dew (F), Navillera Flats (F), Alicia's Flower Wings, Pure Dew (M), Navillera Loafers (M), Oversized Shirt, and Overly Cute Puppy. December 6 to December 12 in the Special Promotions > Limited Time category in non-Reboot worlds only. Please note that the following jobs are not available: Hayato, Kanna, Cygnus Knights, Xenon, Shade, Zero, Beast Tamer, Kinesis, Blaster, and Cadena. December 6 to December 12 in the Special Promotions > Limited Time category in both Reboot and non-Reboot worlds. Check out the Female Face Styles available now: Odd Eye, Bright Eyes, Sugar Face, Insolent Face, Pure Gaze, Piercing Gaze, Puppy-Eyed Face, and Spica Face. December 6 to December 19 in the Special Promotions > Limited Time category in both Reboot and non-Reboot worlds. 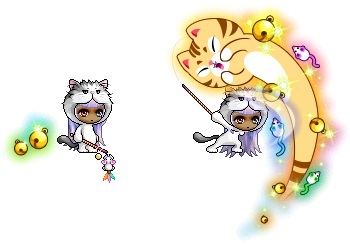 Get in touch with your inner fuzzy kitty when you wear this permanent outfit package!